This CD is with a quintet, a quintet that had the luxury of working for two weeks prior to the recording session. �The date was a lot of fun� Tim Hagans recalled. �We had played the music for two weeks on tour so we were ready to hit. There was a special cohesion happening, and the rhythm section has a special �feeling� when they play. It was very comfortable playing with these guys. Hal did a great job of putting together the music for this date� Hagans said. Charlie Parker�s "Constellation" is a be-bop classic. But Hal explains the odyssey in finding the original version. �I miss-copied it on the lead sheet. Bird used a "Honeysuckle Rose" bridge and I used an "I Got Rhythm" bridge. When I realized that my version of the bridge was wrong, I researched (with a friend of mine in Detroit) for three days to find the correct bridge.� Instead of using the cliche approach most musicians have in dealing with the music of Parker, the quintet uses gestures to get to the �pulse� (which is a pseudo-form in and of itself). 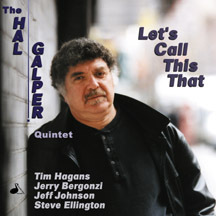 Fantastic solos by Hagans and Bergonzi highlight this arrangement. �This performance is really in one,� Hal illuminates. In discussing his arrival in New York, Hal remembers �When I first came to New York, it was a cold town. Someone told me to get off at the Port Authority, so I did. It was at 178th street at Two O� Clock in the morning with my B-bag. The subway was 20 cents, but I only had 19 cents, so I had to walk one hundred blocks. Nobody would give me a penny so I could ride on the subway!� Hal eventually became �in demand� as a rising young pianist. He was soon hired by Chet Baker. �Chet Baker was great. It was my first big-time gig. I learned a lot. He was a real improviser.� The Chet Baker group with Hal recorded an album for Limelight in the mid-sixties. This CD represents an artist who strives for a consistent level of performance and artistic vision. Hal has stayed the course for many years, and this experience has allowed him to reach for his own voice and sound. The work of a real musician cannot be ignored and for Hal and his quintet, the sounds of this band should be heard around the world.